At the dawn of history, when the ancients first gained self-awareness, their first step was to search for and identify the place they occupied within the vastness of the starry firmament. This search for meaning and identity was also the primal force behind art. The winter solstice, when new life is reborn; the summer solstice, when the great pendulum of the seasons swings back again; the spring and autumn equinoxes, milesones at the midpoint between extremes. I believe that if we trun once more to our ancient observation of the heavens, we will find glimmers that point the way to our future. Paved with optical glass, the stage sits on a kakezukuri framework of Hinoki cypress. Parallel to the tunnel, it is aligned with the axis of the winter solstice. The best-known example of kakezukuri are probably Kiyomizu-dera temple in Kyoto and the Monjudo hall on Mount Mitoku in Tottori. On the morning of the winter solstice, the optical glass stage glows as it catches the light on its cut edges. The auditorium is a full-size recreation of a ruiined Roman amphitheater in Ferento in the Lazio region of Italy. To the audience, the glass stage appears to be floating on the surface of the sea. The design of the stone stage is baed on the dimensions of a Noh stage. 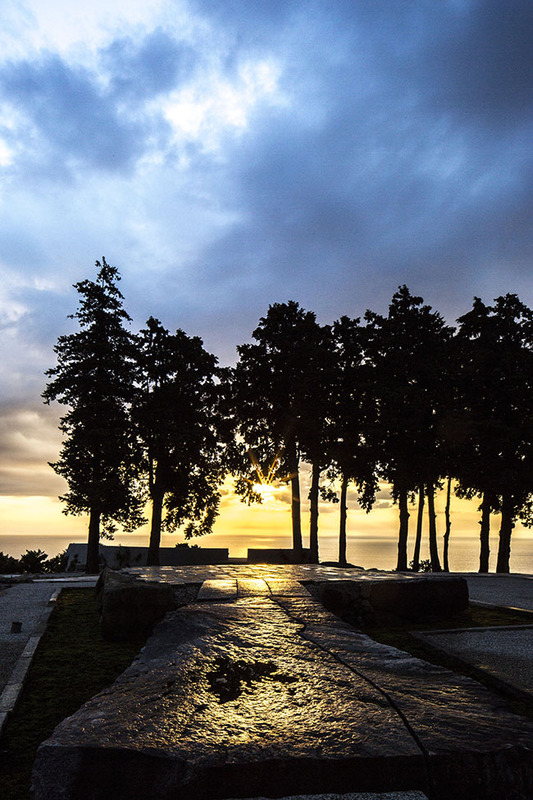 It is constructed mainly out of the many rocks dug up when the site was being prepared for development. Just a few meters below the surface here is hard bedrock, while the Nebukawa and Komatsu stone quarries are located nearby. At the each of the stage's four corners are large stones which were dug up from the nearby Hayakawa Quarry and were originally destined for the walls of Edo Castle. From the chisel marks on them, they appear to have been quarried in the early years of the Edo period (1603-1868) and then abandoned. For the hashigakari, or bridgeway, leading to the stage, a single 23-ton stone slab is used. It is a piece of Takine stone that I came across by chance in Kawauchi in Fukushima prefecture while scouring Japan for rocks and stones. The Japanese word honkadori refers to the practice of using a quotation from a classic old poem as the starting point for creating a new work of art. The Uchōten tea house is a quotation-and-reinterpretation of the Taian tea house, thought to have been designed by Sen no Rikyû. Taian is regarded as a perfect expression of the simple, modest style of tea ceremony (wabi-cha) favored by Rikyû. Light comes through exposed wattle windows into a tiny two tatami-mat room to creat an extraordinary space out of the shadows. Whatever wood was most easily available was used, rather than anything rare and precious, while the walls were of cheap mud plaster. 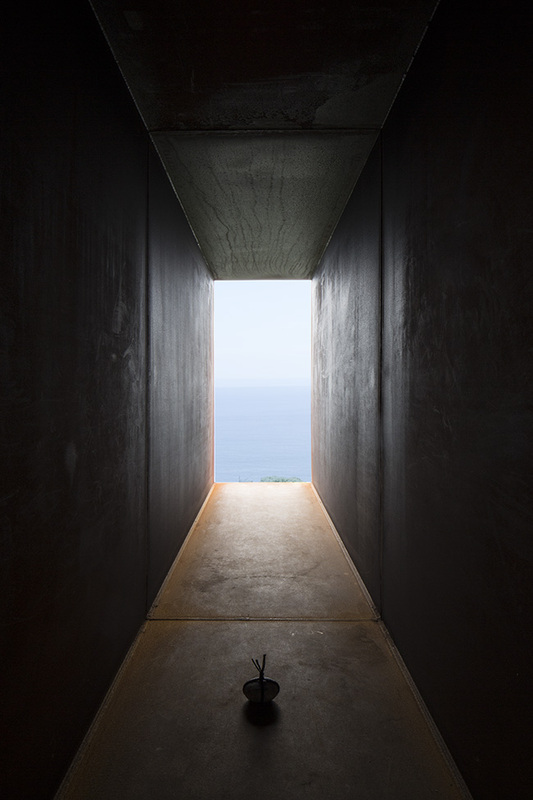 Rickû deliberately recreated the sacred "simplicity" of seclusion deep within the mountains. I copied the dimension of th e Taian tea house without the slightest deviation. Tenshoan, another tea house attributed to Rikyû, once stood here in Enoura, the home of the Odawara Art Foundation. When Toyotomi Hideyoshi laid siege to Odawara Castle in 1590 as part of his campaign to eliminate the Hōjō clan, he is supposed to have ordered Rikyû to build tea house to boost the morale of his generals. That was just one year before Sen no Rikyû committed suicide. I decided to incorporate this local memory into the thea house. With great care, we removed the rusty corrugated iron roof from a local stone barn for storing tangerines to use as the tea house roof. If Rikyû were alive now, a rusty piece of corrugated iron strikes me as precisely the kind of material he would use. When it rains, you can hear the raindrops falling from the heavens and drumming on the iron roof: hence the teahouse's name of U-chō-ten ("rain-listen-heaven"). 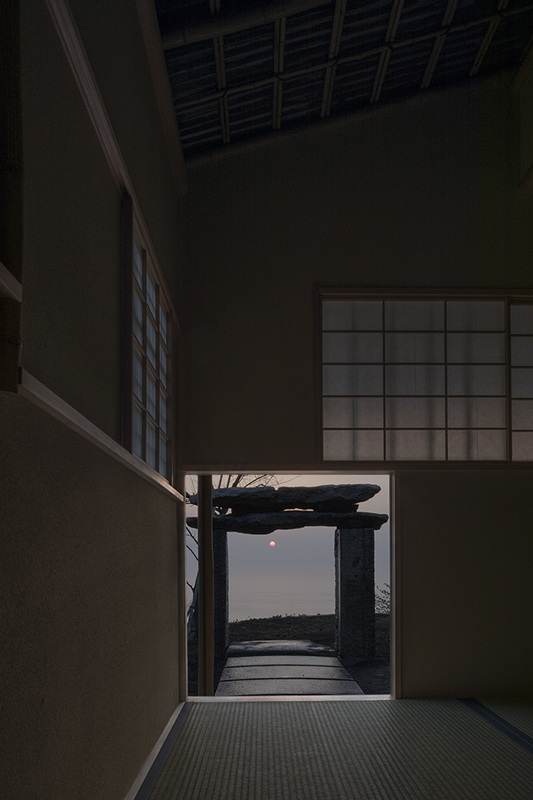 At dawn on the spring and autumn equinoxes, the sun shines through the nijiriguchi crawl door. The step of optical glass in front of the crawl door also glows when it catches the sunlight on its cut edges. The tip of this stage points toward the sun at midday on the spring and autumn equinoxes. The meridian is the great circle running from pole to pole, forming a line that joins the north ("the direction of the rat") to the south ("direction of the horse"). The stage was built by heaping up Nebukawa stones. Since it reminded me of the stone chambers found in old burial mounds, I place some stones and a fragment of a stone sarcophagus from an ancient tomb inside it.